Set your Trac-Yak Paddler into Tiosaronda Bay and venture south River Ridin’ down the Hudson. Be sure to take plenty of pictures to capture your Huck Finn journey of adventure. Tow a cooler, pack a lunch, play with the water or just make it a relaxing family outing. Trac-Yak Paddler: You will paddle for 2.5 miles. to the state boat launch and retrieval site. You’ll paddle on the left side of the river at all times till you get to the take out. This trip is an estimated 1.5 hours in length. Trac-Yak Lazy River: You will float and not paddle for a lazy river ride enjoying the scenic beauty. This trip is estimated to be 2.5 hours in length. If you would rather not go down the river, then have fun practicing your paddling skills in our big water play area. Iraquois Indian for “meeting of the waters,” our River Water Sports offers several levels of water activity from extremely gentle to Lazy River. Take a Trac-Yak, kayak, pedal boat, rowboat, or stand up paddle board for your River Ridin’. You will find several offshore sandbars to offer you a unique chance to explore natural habitat and fish. Feel a little bolder, then take a trip across the Bay to Sunrise Beach, have some lunch and explore. When you paddle back check out the whitewater activities or Rockwell Waterfalls to highlight your trip. Don’t really feel like getting wet, yet you want to do some River Ridin’ to check out the real estate and lay in the sun, fish or swim? Check out our 50 HP 21′ Pontoon Party Boat the Suncruiser. Go slow and feel the freedom of being a Captain on the water with your family. Want to go a little faster? We can put you on top of a Jet Ski for some fun. You will go to our Jet Ski School with written and demonstration tests and then be qualified to learn how to be a Jet Ski driver. You will play out in the deep waters of the Bay under our watchful supervision at all times. How about those fish? Well they are there! We can get you into a rowboat with a trolling motor, and let you go after the small mouth base, northern pike, catfish and brown trout. Any thing over 6 feet in length has to be reported to our staff. 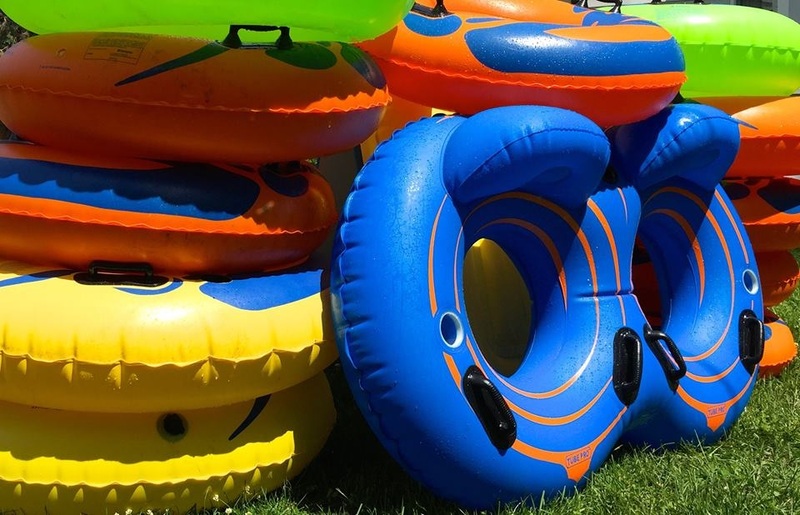 Have your own idea of where to go River Ridin’ and want to rent a Trac-Yak Paddler, single or double donut tube or SUP Board to check out Lake Luzerne and beyond. There are many nice lazy river spots to explore in your tubes or trackers such as Buttermilk Falls and Bear Slide eight miles upriver. Boat shoes required and life vests required.